Has anyone heard of this – equity vs equality – in Islam? I’m sure most of us would have heard the misconception that Islam is a ‘gender-biased’ religion which favours the males over the female counterparts. But, we hardly hear about why Islam is for equity and not always equality. That’s not to say that Islam isn’t a fair religion – it is in fact very fair with regards to its treatment to both genders but our perceptions has been shaped by the media so much so that ‘equality always means fairness’. You may ask, what is the difference between equity and equality? To answer the question, I would give an example of two person: a 30 year old man and a 3 year old child. Equality would mean giving both of them equal amount of food but in our minds, we would think that it would be too much for the child to consume that amount of food. Equity on the other hand, means giving both of them according to their needs depending on their ages. During class yesterday, my professor- masha’Allah a very wise man – shared with us an interesting case which depicts this equity vs equality in Islam. I was trying to find the case but it seems that either it’s not available in English (the case was in Arabic) or that it had happened more than half a century ago thus perhaps you can only find them in books but not online. Allahu Alam. Insha’Allah, I’ll narrate it the best that I can. The incident took place at an American hospital in the 1950s. Two babies were born at the same time – a boy and a girl – and both of them were taken together by the nurse to be weighed. When she returned the babies to the mothers, both claimed that their child was a boy. This immediately became a problem because in those days, DNA testing was not yet available so doctors needed to find another way to solve this dilemma. They tried to compare the blood types of the babies with the mothers but they had similar blood types. Since science had failed them, they turned to the Church for help. The priest said that it was beyond his ability to solve something like this and he was not able to help them too. An Egyptian doctor who heard about the case told the American doctors that he might know of someone who is able to solve this conundrum but he is in Egypt. This person the doctor was referring to is a well known Sheikh of his time. Both American doctors travelled to Egypt to meet this Sheikh and using a translator, they described to him the situation and asked him for advice. The Sheikh replied saying that yes, the solution is in the Qur’an and he then quoted from the Suraah which mentions about the law of inheritance . The American doctors were confused with the Sheikh’s reply and told him that they were not asking about the Islamic law of inheritance. The Sheikh then told them that this too can be applied to the babies. His advice was to measure the concentration of breast milk of both mothers. If the mother had given birth to a boy, the concentration in her milk would be twice of the mother who had given birth to a girl. Both doctors became Muslims afterwards because to them, it was puzzling that how Prophet sallallahu alayhi salam would be able to have such knowledge when he was only a dessert Arab and unlettered. The knowledge would have to come from God. Subhan’Allah! Allahu Akbar! I couldn’t help but teared up in class yesterday. There is so much wisdom in the Qur’an that have yet to unravel but still, there are ignorant people who would just pick an ayaat and then make an assumption about Islam without studying it in depth. And even more unfortunate is when you have Muslims questioning on the ‘fairness’ of Islam. My Professor mentioned that a few years ago, a French Islamic scholar by the name of Garodi (not sure if I spelt his name correctly), came to my university to give a lecture. He quoted this ayaat about the law of inheritance and said that he would turn the laws around (instead of females receiving one share, he proposed that they receive two) in cases whereby she has many children under her care. The scholar said that it is only fair she receives more because of the burden of raising children compared to a man. During the Q&A, someone asked him whether by doing so, he was changing the laws of Allah. My Prof did not mention what his reply was, but said that the laws of Allah is based on justice and equity although in the ‘dunya terms’, we deem it as unfair. We need to place our trust in Allah that whatever laws that was commanded was for our own good – and that He knows what is best for us. We tend to come across a lot of issues that have sprung up over the last decade, i.e. the difference in covering for men and women, Muslim man allowed to have 4 wives etc. but we should not be embarrassed when it comes to explaining to others about these issues. The Qur’an came as a guide book to mankind thus, it is without a doubt that its instructions are for us to live and function well in this Dunya. Without proper guidance, our lives become meaningless and without direction. 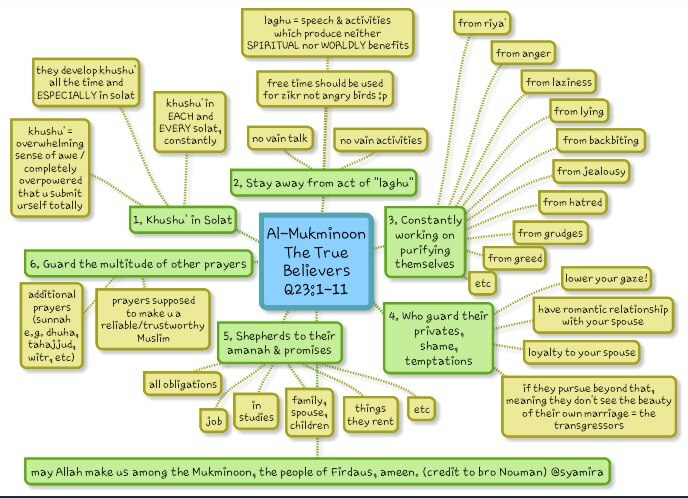 I found another useful mindmap online of Brother Nouman Ali Khan’s lecture on the tafseer of Suraah Al-Mukminoon. Hope it’s beneficial insha’Allah! You can find his whole lecture online too. A friend asked me this question couple of days ago: How did you convince your mom to allow you to wear niqaab? I replied her saying that it’s a good question because I don’t know. I didn’t sit my parents down and explained to them why I want to wear niqaab or gave them the daleels from Qur’an and Sunnah. I have done neither of that but there’s one thing I realized which proved effective al-Hamdulillah and that is: lots of patience and dua. When I had the intention to wear niqaab, I was thinking to myself that it’ll only be possible after I got married because at that time, my parents were against wearing big hijaab and abaya. Each time before leaving my room, I would actually make dua that my parents would not tell me ‘go back to my room to change out of my old woman’s clothes’. And if I wasn’t verbally poked fun at by my family for dressing that way, my relatives would do a good job at that. Everyday felt like a battle just to properly cover my aurah. Subhan’Allah over a period of five years, there was a transition from my former tight clothes to much looser ones along with bigger hijaab. Al-Hamdulillah, it was all by His will. I was starting to wear baggy pants with longer tops, followed by skirts and then dresses and finally abaya. My mom changed her wardrobe as well. One day she told me that she wanted to get rid of clothes that revealed her figure because she didn’t feel comfortable in them and it was replaced by bigger and longer tops as well. The last bit I want to share is about something which took me by surprise. A couple of months ago, my mom came over to visit me for a few days. We were walking back to my dormitory and the there were a few sisters walking ahead of us. I’m not sure if I have mentioned this before but I’m currently studying at an Islamic university thus the types of clothing we usually see is sisters with baggy abaya and khimar. I was telling my mom that the colour of the sister’s khimar is beautiful but left the part where ‘the khimar is beautiful too‘ out of the conversation because I know how she feels about it. But then she said it. “The khimar is beautiful too. Do you want me to get it for you tomorrow?”. I was squealing in delight inside, completely taken aback by those words and thinking did my mom actually say that? I controlled my excitement and tried to reply calmly like it was no biggie, “Yeah sure, but just one will do”. The next day when she went out, she bought three different coloured khimars and told me, “Make sure you wear it to class”. My intention for sharing these is not about my ‘journey to wearing niqaab’ or anything of that sort. The point I actually want to make is that dua changes the impossible to possible if Allah wills it. Several times when we make dua, myself included, we might not have that 100% trust in Allah SWT that it’ll change any of our situations. To those who do not believe, the thought of raising our hands and asking from a Higher being for help may sound incredulous but we Muslims, sometimes fall into that category too. We think, “how is it possible to get out of this problem. No one can help me and you want me to make dua?”; “How can I do this when there is no one supporting me?”. The truth is, we lack trust in Allah SWT. We know He is there to help when we are in need, but we may think that it is only through our efforts and hard work will things get done. We only give credit to ourselves when we manage to achieve something or solve a problem. But it is only when we can’t see the light at the end of the tunnel, then He comes to the picture as a last resort for help. If you ask me five years ago, whether there will come a day where my parents will let me wear niqaab, I will tell you that that’s not possible. But I look back now and thought that I must have forgotten that Allah SWT is the controller of our hearts and situations. We think that we have everything within our grasp but the One with ultimate control over everything is Him. I don’t believe I put 100% trust in Him when I made dua seeing how my situation seemed bleak at that time but I knew I had no one to turn to for help except Him. Whatever situation any of you are in right now, and you feel like there is no way out and no one to listen to you, make dua and be patient of a better outcome. Pray two rakaah for relief if something is distressing you and open the Qur’an when you are in need for answers. Our dependence and reliance is on Him to provide ease for our hardship, not on people and especially not thinking that only we can help ourselves. “Hi good morning to all of you. My voice is a bit hoarse, so please bear with me. I thought I’ll just introduce myself. My name is Richard, I’m a medical doctor. And I thought I’ll just share some thoughts of my life. It’s my pleasure to be invited by prof. Hopefully, it can get you thinking about how…as you pursue this…embarking on your training to become dental surgeons, to think about other things as well. Since young, I am a typical product of today’s society. Relatively successful product that society requires. From young, I came from a below average family. I was told by the media… and people around me that happiness is about success. And that success is about being wealthy. With this mind-set, I’ve always be extremely competitive, since I was young. Well, I was wrong. I didn’t have everything under control. About last year March, I started to develop backache in the middle of nowhere. I thought maybe it was all the heavy squats I was doing. So I went to SGH, saw my classmate to do an MRI, to make sure it’s not a slipped disc or anything. And that evening, he called me up and said that we found bone marrow replacement in your spine. I said, sorry what does that mean? I mean I know what it means, but I couldn’t accept that. I was like “Are you serious?” I was still running around going to the gym you know. But we had more scans the next day, PET scans -positrons emission scans, they found that actually I have stage 4 terminal lung cancer. I was like “Whoa where did that come from?” It has already spread to the brain, the spine, the liver and the adrenals. And you know one moment I was there, totally thinking that I have everything under control, thinking that I’ve reached the pinnacle of my life. But the next moment, I have just lost it. Secondly, a lot of us will start to get numb to our patients as we started to practise. Whether is it government hospitals, private practice, I can tell you when I was in the hospital, with stacks of patient folders, I can’t wait to get rid of those folders as soon as possible; I can’t wait to get patients out of my consultation room as soon as possible because there is just so many, and that’s a reality. Because it becomes a job, a very routine job. And this is just part of it. Do I truly know how the patient feels back then? No, I don’t. The fears and anxiety and all, do I truly understand what they are going through? I don’t, not until when this happens to me and I think that is one of the biggest flaws in our system. Because the pain, the anxiety, the fear are very real even though it’s not real to you, it’s real to them. So don’t lose it and you know, right now I’m in the midst of my 5th cycle of my chemotherapy. I can tell you it’s a terrible feeling. Chemotherapy is one of those things that you don’t wish even your enemies to go through because it’s just suffering, lousy feeling, throwing out, you don’t even know if you can retain your meals or not. Terrible feeling! And even with whatever little energy now I have, I try to reach out to other cancer patients because I truly understand what pain and suffering is like. But it’s kind of little, too late. Few things I’d learnt though: 1. Trust in the Lord your God with all your heart – this is so important. 2. Is to love and serve others, not just ourselves. There is nothing wrong with being rich or wealthy. I think it’s absolutely alright, because God has blessed so many people with good wealth, but the trouble is, I think, a lot of us can’t handle it. The more we have, the more we want. I’ve gone through it, the deeper the hole we dig, the more we get sucked into it, so much so that we worship wealth and lose focus. Instead of worshipping God, we worship wealth. It’s just a human instinct. It’s just so difficult to get out of it. 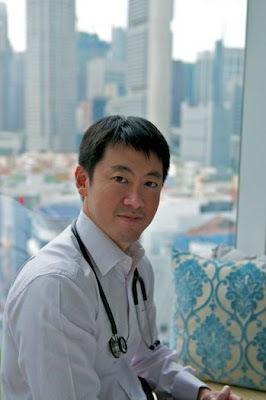 Dr Richard Teo said these words on Jan, 19, 2012. Just recently a few days ago on October, 18, 2012 he passed away. Something for us to reflect on. ‘Live life to the fullest’ – We say this often but what do we actually understand from it? Does ‘living our life to the fullest’ consists of pursuing wealth, status and material objects but yet devoid of spirituality in it? Dr Richard is not a Muslim but his words serve as a reminder to us that chasing after this Dunya only bring temporary happiness but our relationship with God also play an important part of ‘living life to its fullest’.